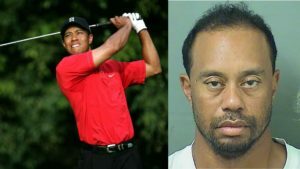 Tiger Woods was found asleep at the wheel by police on Monday, May 29th and arrested for suspicion of driving under the influence. Woods had to be awakened and his speech was slurred, arrest report says. The report also said Woods also told police he “takes several prescriptions” due to a back injury. After consenting to a Breathalyzer test, registering a 0.000, and a urine test, Woods said in a statement that alcohol was not involved and that he had “an unexpected reaction to prescribed medications.” Woods is currently in a back rehabilitation program following surgery, and said he did not realize the mix of medications had affected him so strongly. “I understand the severity of what I did and I take full responsibility for my actions,” Woods said. The 41-year-old golfer has undergone multiple back surgeries, most recently a fusion surgery on his back; his fourth operation since 2014. Woods said in a blog post published last week that it provided instant nerve relief. “I haven’t felt this good in years,” he said. While prescriptions can be an effective tool for pain management, patients and athletes should be given comprehensive postoperative strategies to control pain. These include medications like anti-inflammatories, acetaminophen, opioids as well as regional anesthesia techniques. Olympian Nikki Stone overcame back pain and became America’s first Olympic champion in inverted aerial skiing with the help of rehabilitation and physician recommendations. Unlike Tiger, there are some people who don’t see relief after spine surgery. They develop constant back pain and/or shooting leg pain. For them, spinal cord stimulation can be a very effective procedure. There are exciting innovations in the field of pain pacemakers and neurostimulation therapies that use electric impulses to relieve chronic pain. Posted in Back Pain, Blog, Celebrities, Celebrity, Celebrity Hot Topics, Medications, Procedures, Sports, Top Pain Reliefs.